The award was founded by Daniela Gioseffi, who recently won The John Ciardi Award for Lifetime Achievement in Poetry for 2007, and is also the founding editor of Poets USA.com, NJPoets.com, & Italian American Writers.com. She is the author of eleven books from major presses and her new and selected poems “Blood autumn (Autunno di sangue)” was published in a bilingual edition by Bordighera Press in 2007. The co-founder, Alfredo de Palchi, is a poet and editor of the literary magazine Chelsea and a trustee of The Sonia Raiziss-Giop Charitable Foundation, the event’s sponsor. Every year Bordighera Press – founded by Anthony J. Tamburri, Dean of Calandra Institute, Fred. L. Gardaphé and Paolo A. Giordano – is dedicated to finding the best manuscripts of poetry in English by American poets of Italian descent. Each winning manuscript will be awarded a cash prize of $1,000 for the winning poet and $1,000 for the commissioned translator. The poet, who must be a U.S. Citizen, has to translate his/her own work if bilingually qualified. The main aim of the prize is to keep alive the Italian language, defined by Montale as “the falling language”, among immigrants and Italian American authors. Tony Magistrale, the 2007 winner of the Bordighera Poetry Prize, was born in Buffalo, New York, the grandson of Italian immigrants from Bari, Italy. After obtaining a Ph.D. from the University of Pittsburgh, Magistrale spent a year at the University of Milan as a Fulbright lecturer. Since then he has returned to Italy on multiple occasions, and these trips inspired the poems in this collection. Magistrale is a Professor of English and Associate Chair of the English Department at the University of Vermont. Before reading the poems, each candidate was introduced by the distinguished Poet-Judge of The Bordighera Poetry Prize, 2007, Michael Palma, who has written of Magistrale's poems: “‘The Plan,’ which describes a Texas-style barbecue in a Venetian twilight, concludes: ‘In this most secreted city, I divulge no secrets / Content to wear my hat at rakish angle / Tend the grill, savor its sizzle,’ a characterization that neatly fits the many fine poems of Anthony Magistrale whose sizzle is sure to whet the appetites of readers. The tones may vary, from the moodiness of ‘Venetian Poems’ to the playfulness of ‘Beware, the Bible Warns, of Fallen Women,’ but constant throughout are the intellectual alertness, satisfying structures, and vivid descriptions: adjectives are often surprising as in ‘dense, pasty Milanese rain,’ but are almost always just right. ‘I Nemici’ begins: ‘The act of casting shape from chaos / breeds enemies.’ Magistrale’s point is well taken there but in this case it’s much more likely to breed friends and admirers”. From a joyful mood we came to quieter and touching tones. 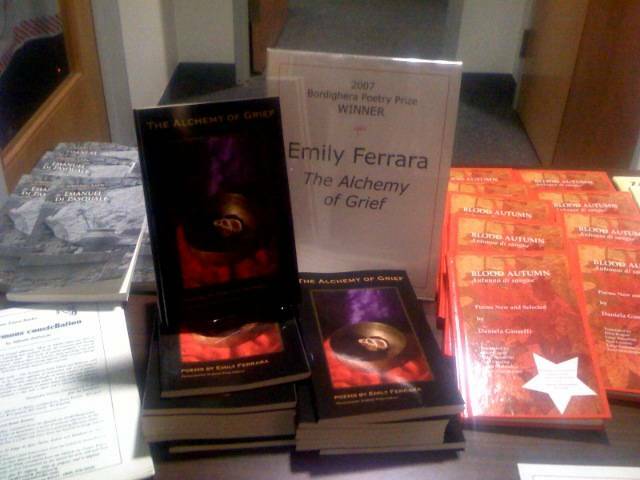 Emotions and smiles entered the room with Emily Ferrante, 2006 Winner of The Bordighera Poetry Prize for The Alchemy of Grief. She is Assistant Professor of Family Medicine and Community Health at the University of Massachusetts Medical School, where she teaches and has developed curricula in creative writing, communication skills, mindfulness meditation, and cultural competence in medicine. Ferrante also directs the grants and special projects division for the school’s Office of Medical Education. Through the reading of her poems, ‘Mother’s Lament, Cremation, The Winter After’, we commemorated the fourth anniversary of Emily’s son’s death. A coincidence. Her shaking yet strong voice was alternating with Sabine Pascarelli, her translator. Sabine lives in Tuscany with her husband and two sons and she came to New York just for the award. She said, “I took a while before accepting to translate the work because through the translation I get closer to Emily and her pain. A touching and profound work I couldn’t refuse to do”. Distinguished Poet Judge for 2005-2006, Daniela Gioseffi, says of Ferrante’s book: “This is excellently controlled craftsmanship, conveying deeply felt emotion. The grief of loss is sharply poignant and real, yet never maudlin or self-indulgent. The music of the lines is subtle and fine. The tension between the controlled craft and the poignancy of the theme makes the reader participate in the poems and feel with the poet, sharing the human despair and transcendent emotions that bring us through to survival. This book shares with all of us the profound theme of the loss of a child to fate, an issue many American parents can identify with in these dark days of our republic”.